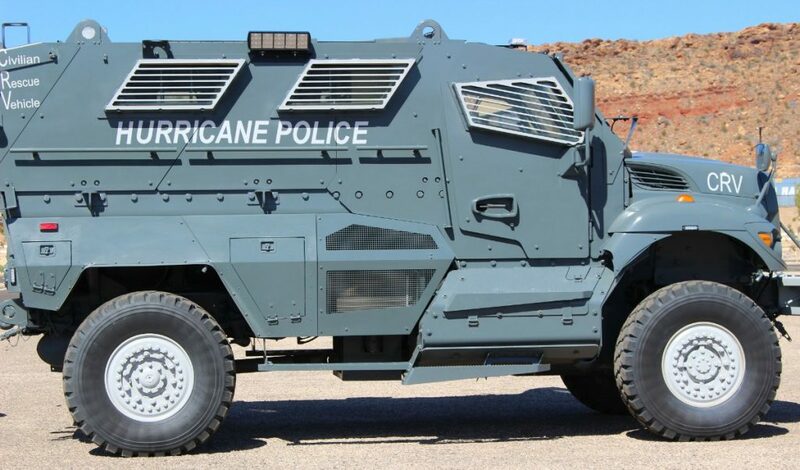 HURRICANE — The Hurricane Police Department unveiled a new high-mobility armored rescue vehicle this week, sporting a new paint job and outfitted with everything needed for just about any type of rescue operation the department could face. 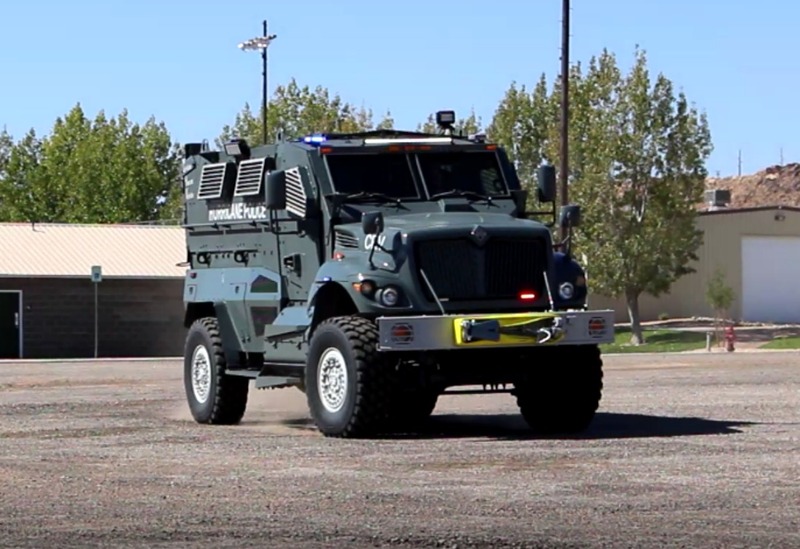 Presented during a media event Wednesday at the Washington County Fairgrounds in Hurricane, the military vehicle, known as a mine-resistant, ambush-protected vehicle or MRAP, was delivered to the Hurricane Police Department in 2016 and has spent the last 12 months receiving a makeover. 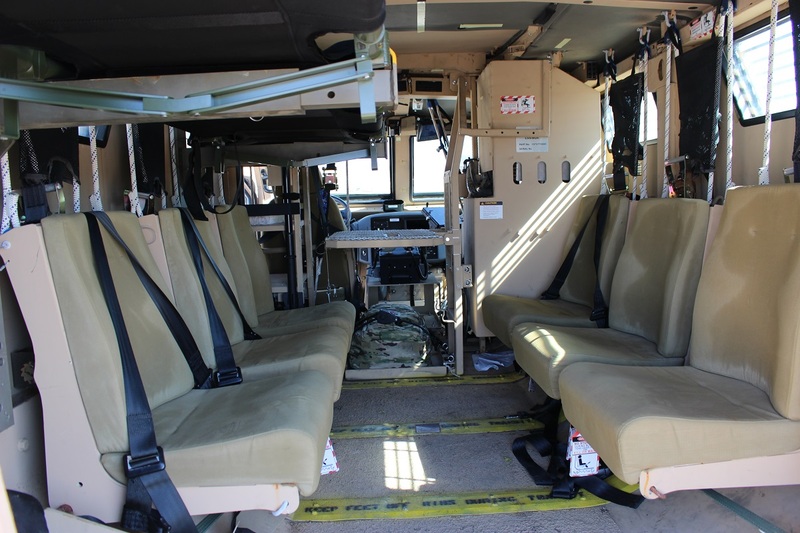 Through a series of modifications, the armored vehicle was outfitted to function as a rescue vehicle, equipped with medical supplies, rescue equipment and other items needed for any type of emergency or rescue operation. 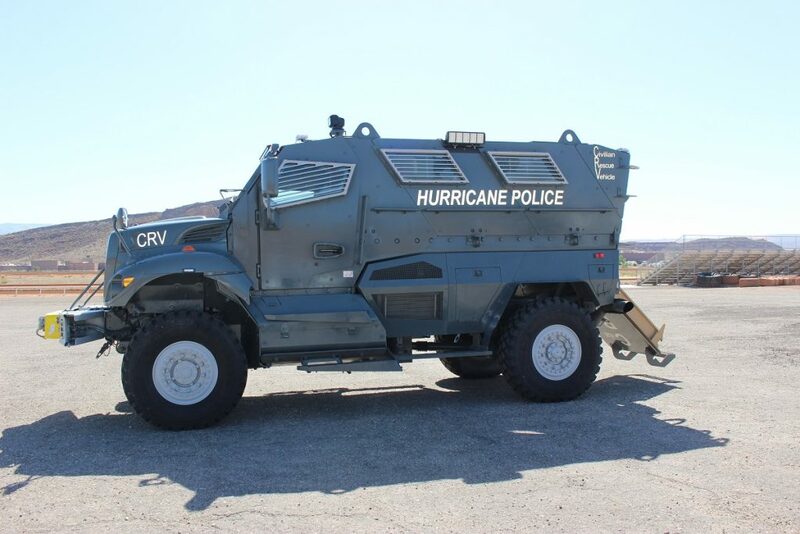 “We’ve outfitted it to be used as a civilian rescue vehicle, or CRV, and hopefully we’ll never have to use it, but it can be used in a natural disaster, flooding, something really bad like an active shooter or other large incidents,” Hurricane Police Officer Ken Thompson said. 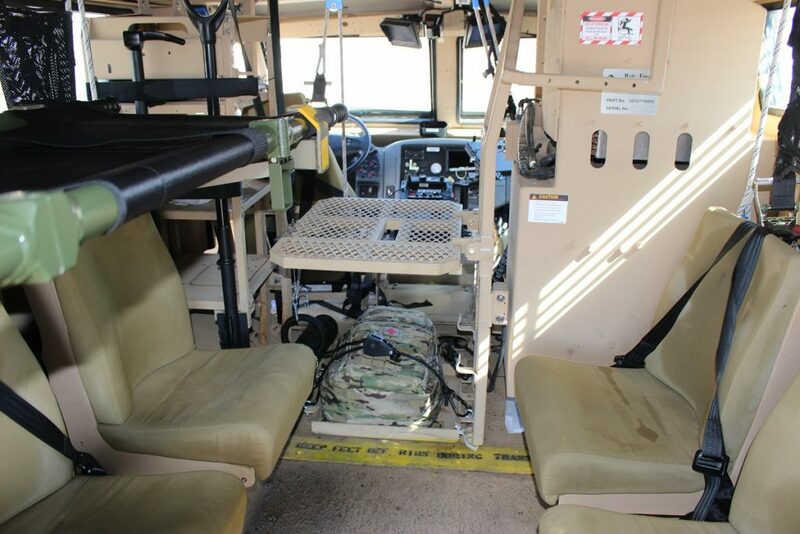 The vehicle can accommodate at least 20 individuals during transportation operations, cross rivers with a depth of more than 3 feet, drive over large obstacles and debris and makes even difficult rescues possible from areas too remote for other vehicles to traverse. The CRV is equipped with Michelin Run Flat tires designed to withstand harsh conditions, and it can continue moving at more than 30 mph even if one or all of the tires become flat. Further, the high clearance allows it to go through 36 inches of water safely. “The only way we could have ever gotten a vehicle like this is through the ‘1033 program,'” Thompson said. Excess property from the Department of Defense that might otherwise be destroyed is transferred to law enforcement agencies across the country, limited to reserve stock or items no longer needed. The only costs involved with acquiring equipment obtained are pickup or shipping costs. 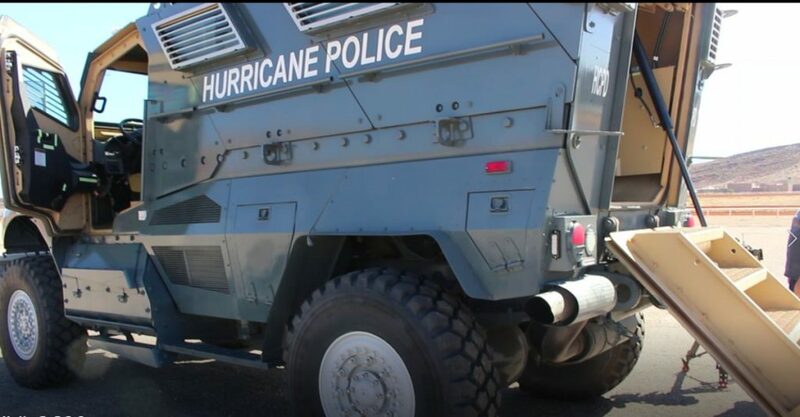 Many of the items would otherwise be unobtainable given their costs, as the Hurricane Police Department, like other police agencies, has limited resources to acquire public safety equipment. The original cost of the CRV was more than $500,000, but the department paid just over $13,000 in shipping and transfer fees for the equipment, Thompson said. Both Washington and Iron County Sheriff’s offices own MRAP vehicles they obtained through the 1033 program. Since its inception, the program has transferred more than $6 billion worth of property to the more than 8,000 law enforcement agencies enrolled in the program. Nice slat armor over the windows it should come in handy when you’re taking rocket propelled grenade launcher fire when going down Main Street in hurricane, nice job with the taxpayers money maybe next time we can get a Blackhawk helicopter with the machine gun. Good grief. How about some surface to air and or an ICBM or two, you know just in case. Nice PR spin on a SWAT vehicle! Actually though, I’m glad the departments have these. There’s two things I hope for though. First is that they never have the need to use them as SWAT vehicles. Second is that they don’t feel they have to take them out when there’s no need. I bet they put a radar unit on it and park it on Hwy 9 to write CS speeding tickets. HPD’s idea of public service. White elephant. Maintenance costs and trouble will out weigh its utility. Expect to see this parked or excessed within 5 years. “Civilian rescue vehicle”. Riiiight. Lol. That’s a “militarized police delivery vehicle”. Anything to protect the men and women of the Hurricane PD. Continue the good work guys. Keep up the good work. One can take comfort knowing that the city of Hurricane is now prepared for the pending zombie apocalypse. 4:17am? Get off the dope. I am sure we all agree that we are thankful to live in a relatively low crime part of the United States. As such, the need for another one of these customized military vehicles to respond to SWAT calls is small, to none. I would submit that acquisition of this MRAP for civilian rescue purposes, is a waste of taxpayer money. The police have done well to shutdown illegal drug labs, and deal with armed bad guys, with their prior inventory of equipment. Well said. I am skeptical of police having these military surplus vehicles but your recommendation is thoughtful and an intelligent application. This called conditioning the masses for what the state will do if you don’t obey. It will be a ride at next year’s Peach Festival. Wow, 1033 must not have a lot if oversight, something like that should have gone to the boarder patrol. Though from a local perspective, it’s pretty irresponsible of Washington County to even requisition a maintenance nightmare like that, the price of a set of tires for that rig would probably buy a police cruiser. One of our elected visionaries is probably planning a big fat backdoor payday on the resale when the next budget meeting decides “we can’t afford the upkeep”, YOUR TAX DOLLARS AT WORK!!! HAHAHAHAHAHAHA….wait, for citizens and taxpayers, this is rather sad. I guess the Methheads in Hurricane Utah are packing RPGS now a days! GO FALCONS! I hope none of you making these negative comments ever have to eat crow because one of your loved ones is involved in a situation where this vehicle gives the police the option of being close to the scene with bullet proof cover. Is this vehicle needed for routine daily operations? No. That is obvious. However, with what is happening all over the world, local law enforcement is trying their best to be prepared for the worst case scenarios. Shame on any of you trash talking something that may save innocent lives in your community.